The Church of Sant' Angelo dates to the V-VI centuries A.D. and it is one of the most ancient churches in Italy. It was probably built on the remains of a Roman temple when paganism was decaying and Christianity started to appear in the territories of the pre-existing Empire. More previously, this temple had been built on a land sacred to the Etruscans. This makes of the church, and of the place where it is set, two important evidences of the many cultural and religious changes in the Italian peninsula. Umbria is one of the Italian areas where Christianity grew more rapidly. By the VI century A.D., there were already 21 dioceses in a land disputed between Barbarians and Byzantines, and where the populations sought refuge in the new monotheistic religion to escape from the tragedy of wars and famine. At that time, some churches had already been raised, as the one of the Salvatore in Spoleto (IV-V century), but not all of them could survive to time. Many of them took the place of the ancient pagan temples, for instance, the abbey of St. Peter in Valle a Ferentillo and the basilica of Sant' Eufemia in Spoleto. 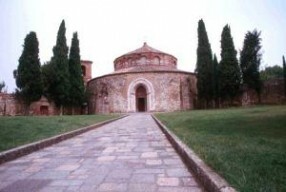 The early Christian church of Sant'Angelo is also called "Padiglione di Orlando", "Tempio di San Michele Arcangelo" or "Tempietto" and it rises on one of the highest places of the town. It can be reached walking down Corso Garibaldi and crossing a narrow path. A small green courtyard represents the entrance to this central-plan building that develops on two concentric surfaces. It has typically Roman characteristics. The two areas, the ambulatory and the central presbytery are separated by a circle of sixteen Corinthian-Roman columns. Given their variety of measures and materials, they were probably carried into the church from another building, as was customary at the time. The two adjacent chapels at the church's external sides give it a Greek cross layout. Those who love mystery and go to Perugia cannot but visit this church. In effect, there are very strange symbols inside. On the doorjambs and on the neck of the Virgin Mary depicted in on of the frescoes some crosses representing the mystic universe of the Templars, a medieval religious confraternity whose legendary history is full of secrets and enigmas. Moreover, at a few metres from the entrance there is a pentagram, namely a symbol linked to the worship of Venus associated to black magic in the Middle Ages.